U.S. streets are getting more dangerous and traffic congestion isn’t going away, so transportation leaders in Iowa are pushing a new idea to improve road safety. A road diet takes away lanes, like converting a road from 4 lanes into a 2-lane street with a center turn lane, which usually slows traffic and improves safety and economic vitality, according to a new video from the Iowa Department of Transportation (IOWADOT) shared by Strong Towns. This thinking flies in the face of typical ideas of roadway expansions. “Curing congestion by adding more lanes is like curing obesity by buying bigger pants,” said notorious planner, Lewis Mumford. Our transportation network should protect and meet the needs of all users, whether walking, biking, taking transit, or driving, and should be financially and environmentally sustainable. Hyper-focus on congestion alone distracts—or contradicts—efforts to improve health equity. Many state departments of transportation have overbuilt their high-speed transportation infrastructure and lack the money to maintain it all. Moreover, there is a big difference between how a high-speed road should function and how an urban street should function. “Very often, these state-level agencies, out of touch with local communities, are the ones pushing for overbuilt, unnecessary projects, and inappropriately applying highway design standards to local streets, with disastrous results for safety and economic productivity alike,” according to Strong Towns, a movement to make communities across the country financially strong and resilient. It’s important to remember that although annoying, congestion isn’t bad for the economy. Some of the most congested cities on earth are the most economically prosperous. Vehicles don’t purchase goods or services, people do. Hence the idea for road diets. The IOWADOT video─along with a fact sheet and additional online content about 4-to-3 lane conversions─educate Iowans about the benefits of road diets. 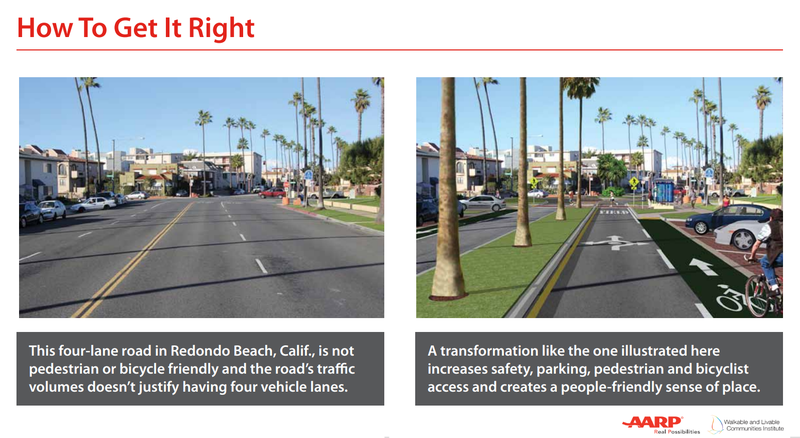 A road diet leaves room to create bicycle lanes, pedestrian crossing islands, bus stops, sidewalks or on-street parking. “When combined with a roadway resurfacing project, a 4- to 3-lane conversion can be completed without any additional cost,” according to the IOWADOT website. When first proposed, one road diet in Lewistown, Pa. was opposed by 95% of residents. After completion, nearly 95% supported the changes, according to the AARP’s livability fact sheet. When determining potential corridors for a road diet, it is important to consider traffic volume, number of intersections, type and location of access points, and a corridor’s crash history. Corridor segments with a history of high motor vehicle fatalities and serious injuries, for example, may need additional considerations. That’s why IOWADOT also conducted the Statewide Screening for Potential Lane Configurations. This effort provided a snapshot of potential locations where a conversion might be successful. “Previous studies have indicated a 19 to 47 percent reduction in overall crashes when a roadway is reconfigured from four lanes to three lanes,” according to the statewide screening. Check out IOWADOT’s website about 4-to-3 lane conversions and share the video with committees, groups and organizations interested in pedestrian safety, public health, active living, climate action or economic development. If you live in Iowa, push transportation planners and elected leaders in your community to pursue 3-to-4 lane conversions on corridors deemed to be potential candidates. If you don’t live in Iowa, push transportation planners and elected leaders in your community to proactively identify where future 3-to-4 lane conversions might be considered in your community. Source: IOWADOT video screen grabs.